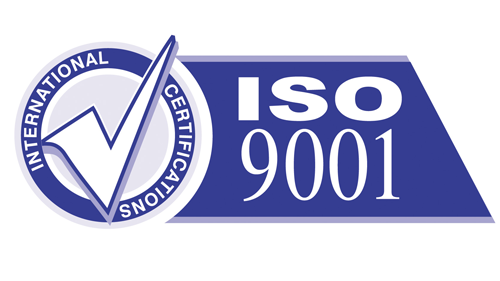 Amphenol PCD Strain Relief Clamp M85049/38-11N M85049-38-11N , Nickel, for D38999/20, D38999/24 and D38999/26 Size B(11) Connectors MIL-DTL-38999 III Strain Relief Clamp Cable Clamp Backshell. Amphenol PCD Strain Relief Clamp M85049/38-11W M85049-38-11W , Olive Drab, for D38999/20, D38999/24 and D38999/26 Size B(11) Connectors MIL-DTL-38999 III Strain Relief Clamp Cable Clamp Backshell. Amphenol PCD Strain Relief Clamp M85049/38-13N M85049-38-13N , Nickel, for D38999/20, D38999/24 and D38999/26 Size C(13) Connectors MIL-DTL-38999 III Strain Relief Clamp Cable Clamp Backshell. Amphenol PCD Strain Relief Clamp M85049/38-13W M85049-38-13W , Olive Drab, for D38999/20, D38999/24 and D38999/26 Size C(13) Connectors MIL-DTL-38999 III Strain Relief Clamp Cable Clamp Backshell. Amphenol PCD Strain Relief Clamp M85049/38-15N M85049-38-15N , Nickel, for D38999/20, D38999/24 and D38999/26 Size D(15) Connectors MIL-DTL-38999 III Strain Relief Clamp Cable Clamp Backshell. Amphenol PCD Strain Relief Clamp M85049/38-15W M85049-38-15W , Olive Drab, for D38999/20, D38999/24 and D38999/26 Size D(15) Connectors MIL-DTL-38999 III Strain Relief Clamp Cable Clamp Backshell. 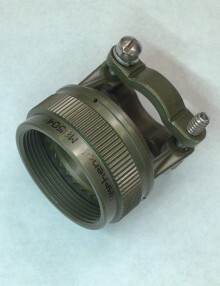 Amphenol PCD Strain Relief Clamp M85049/38-17N M85049-38-17N , Nickel, for D38999/20, D38999/24 and D38999/26 Size E(17) Connectors MIL-DTL-38999 III Strain Relief Clamp Cable Clamp Backshell. Amphenol PCD Strain Relief Clamp M85049/38-17W M85049-38-17W , Olive Drab, for D38999/20, D38999/24 and D38999/26 Size E(17) Connectors MIL-DTL-38999 III Strain Relief Clamp Cable Clamp Backshell. Amphenol PCD Strain Relief Clamp M85049/38-19N M85049-38-19N , Nickel, for D38999/20, D38999/24 and D38999/26 Size F(19) Connectors MIL-DTL-38999 III Strain Relief Clamp Cable Clamp Backshell. Amphenol PCD Strain Relief Clamp M85049/38-19W M85049-38-19W , Olive Drab, for D38999/20, D38999/24 and D38999/26 Size F(19) Connectors MIL-DTL-38999 III Strain Relief Clamp Cable Clamp Backshell. 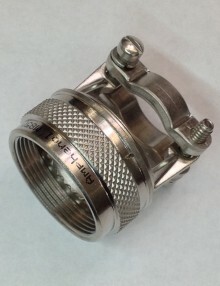 Amphenol PCD Strain Relief Clamp M85049/38-21N M85049-38-21N , Nickel, for D38999/20, D38999/24 and D38999/26 Size G(21) Connectors MIL-DTL-38999 III Strain Relief Clamp Cable Clamp Backshell. Amphenol PCD Strain Relief Clamp M85049/38-21W M85049-38-21W , Olive Drab, for D38999/20, D38999/24 and D38999/26 Size G(21) Connectors MIL-DTL-38999 III Strain Relief Clamp Cable Clamp Backshell. Amphenol PCD Strain Relief Clamp M85049/38-23N M85049-38-23N , Nickel, for D38999/20, D38999/24 and D38999/26 Size H(23) Connectors MIL-DTL-38999 III Strain Relief Clamp Cable Clamp Backshell. Amphenol PCD Strain Relief Clamp M85049/38-23W M85049-38-23W , Olive Drab, for D38999/20, D38999/24 and D38999/26 Size G(23) Connectors MIL-DTL-38999 III Strain Relief Clamp Cable Clamp Backshell. Amphenol PCD Strain Relief Clamp M85049/38-25N M85049-38-25N , Nickel, for D38999/20, D38999/24 and D38999/26 Size J(25) Connectors MIL-DTL-38999 III Strain Relief Clamp Cable Clamp Backshell.